Karen Valentine at My Desert Cottage is hosting the second "Where Bloggers Create II party" on June 19th and I'm thinking about joining. 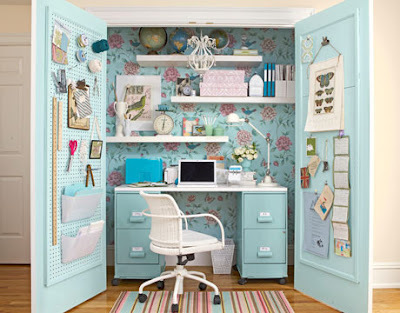 So I've lined up some dreamy offices to motivate me to clean up our office at home, which is where I blog from. Hopefully these divine destinations will inspire me to get the lead out in time. Enjoy! 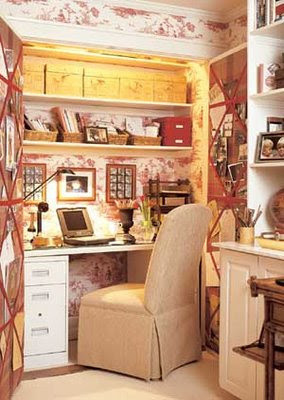 Country Living featured this office in a closet some time ago - love the color scheme, but luckily don't need an office closet right now. Okay this is my "dream" office which from the looks of it is the size of our living room. If you have an office this big to you have to work twice as much? I think this is more realistic - a dash of toile (surely Mr. B won't notice) and the practical things like a monitor and printer. This is a big dash of toile, and kind of looks like my bathroom which I'll have to show you some day, I think Mr. B might get a headache if he had to do his work in this office. The last three images were in my inspiration folder and I didn't source them when I saved them - so I'm sorry to not be able to properly credit the source. I'm trying now to save the source in the picture title so I'll have it three years from now when I want to use it in a post. Now these are worthy inspirations. They all look great in their own way! But I must agree - the fourth office looks the most realistic and practical because of its simplicity.